Chapter 6 Saved by joining the Regimental Band. Here we got a good meal and got into some blankets on a stretcher and a real good spell and sleep. The next five days I stopped here living on good food and did nothing but a bit of writing and was soon all right again. I met Dr Ward, Hame Clark and Innes Weaver in the hospital, all three being attached to it. On the 16th April, 1918, I got pushed out and after being inspected by Dr Ward were sent to the Division HQ and from there to the Battalion dump where I made myself down for the night. I met the Band Sargent in the evening and put the hard word on him but did not get much encouragement until later when he met me and said he thought he could get me in temporary to take a sick man’s place. The next day I got orders to report to the Band and was not at all pleased over it. I had a good cleanup etc., and in the afternoon shifted to the Band billet and was given a baritone and was told it would take a while and that evening I got away and had a bit of a blow. But I was sadly out of form and my lips soon got sore. My teeth were also broken so the next day I went back to Bertrancourt to see Keane and he soon fixed up my teeth for me and after that I got on a lot better. We were in the little town of Acheux for the next couple of days and I thought I was in the sweetest little job on earth; a good bed, good food, not forgetting a few eggs from the farmhouse next door. The only trouble now is whether I can keep this going. Mon. 22nd April, 1918. We left Acheux and went to Louvencourt and Camp in a paddock where four of us built a decent little bivvy sods and sacks and then pinched some straw from the farmhouse next door and were fairly comfortable. The next day we had to leave it and build a fresh one on the other side of the road. Of course it would not do for an officer and men to be together. We remained in this spot for a while where we were doing nothing but practice and play programmes. The solo cornet player (Arthur Turnbull) had been given charge of the Band and is making big improvements in it. We had one day on fatigue, a light job. Also had a bit of drill by the R.S.M who is not too flash on it himself, and a real good bite. I have had a change of instruments and am now on the Tenor. 6th May 1918. We left this Camp and went up to Rossignol Farm to the Battalion, a decent spot on top of a hill with a good few trees about and rock-hard. We were billeted in the farm church and had a bed to sleep in. We put on some good music for the boys who were out for eight days spell. I went into the village close by (Coigneax) but it is just about deserted. Met Dr Ward and had a chat with him. Also landed a few eggs at 5 each. One day we had the pleasure of a couple of shells close by but no one hurt. On the 15th May, the boys went up to the line and again we went back to our Camp at Louvencourt where we struck a good wash. The next few days we did nothing but the usual practice and polish, including buttons etc. The Heads are going a bit panicky lately. I met Jock Taylor here and we went to spend an evening and met Ben Clark, Crickett and Douby. Had a bit of a reunion. Rather late getting home. I also met Jim Steele who told me the sad news of my old mate Bill Clausen. On Sat 18th May, we went up to play for Div’s HQ in Bus, some show too, a decent Chateau in real good grounds. Would not mind living there. 20th May, 1918. The 2nd Brigade held their horse show today. I went over in the afternoon, not very interesting. The mule race, ridden without either whip or spurs over hurdles was a good item and all hands had a good laugh. Sat 25th May, we went back to Rossignol Farm once more and got into our former hotel (the Church). Nothing much happened until Tuesday when the 1st Brigade show was held. 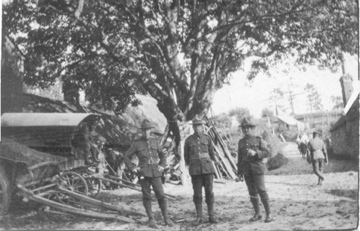 The Battalion left Camp and marched about ten km to the grounds. The first introduction was a few shells on a ridge close by and things looked a bit interesting for a while but old Fritz was good enough to leave us alone for the rest of the day. Our guard won their event, which was about the only item that interested me, besides the mule race, which was more than funny. There were some fair jumping events, which brought back old memories to me and I pictured Lew in all his war paint at the old show. Most of my time I spent looking for old mates and found a good few, amongst them, Harry Ashton and we had a good yarn over Whangarei etc. Other Whangarei boys were Jim Rough L. Moakes, Dan and Joe Gash, Keane Clark, Alex Jack. After the show we marched back to the Camp and I was only feeling a little bit tired when at last we climbed the last little hill. On Friday old Fritz put a couple of shells into the Camp. Luckily the boys were mostly away on field practice and he only got one man who was killed. The next day the boys went into the line again and we dudes returned to Louvencourt dump and played a programme at Div HQ on the way. On arrival we found our little home occupied and we were put into a sort of hole, which was about half large enough to hold the four of us so we set to work to make improvements. After a bit of solid toil we had a nice little hut built out of sand bags, which were given to us (when the owner was not looking). It was just past twelve when we got to bed that night. We stopped in this spot for four days doing a bit of drill and plenty of practice for the Band Quick Step, which is to come off in the near future. Thursday 6th June,1918. We shifted over to Authie and had the usual digging in stint. This time we got well amongst the sand bags so made a good posy. The next few days were all band drill and practice for the quick step. None of the heads seemed to know much about the game and there were quite a few arguments as to what was the right and wrong way. We had a few more shells here but they all went well overhead. 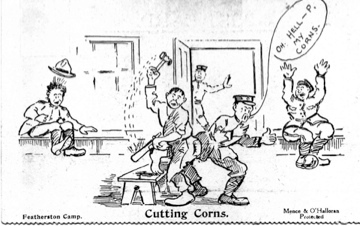 Our Sargent got wounded in the hand while cleaning his rifle, a nice Blighty. Monday 10th June, we shifted a few chains into a wood. This time we landed tents all ready up. The Battalion came out tonight and stayed for three days and then went back to Camp at Henu and again we landed tents. We travelled in a motor lorry this time and played at Div HQ in Pas on the way. Sunday 16th. The Div show was held. The Battalion marched to the grounds again, about 5-km. We played two programmes during the day. There were a big crowd of men there and I found quite a few of my old mates. The rings events were real good this time. Our Guard proved too good for the rest of the crowd and had a good win again. All hands were given a buckshee dinner, a big slice of bread and salmon biscuits, a boiled egg and tea, some feed. A big surprise for the crowd and I think a lot wondered if they would get an entry in their pay books for it. I guess there will be more than three to a loaf after this lot was the usual remark as each man filed out from their tent. However, taking things all round it was a real good days outing. While in this Camp I spent the evening in Pas and was lucky enough to meet Stirl down there and needless to say we both had a lot to talk about. Friday 21st June, 1918. Got NZ mail – one letter only. We all shifted to Dauchelles and this time we are living in huts quite flash, must be winning. We are still on the contest stakes and have less than a week to go now. But we are not marching too badly and I don’t think we will be last. The next day I landed some mail but there were a few letters missing. Sunday 23rd May was the Division Sports. Again the Battalion attended in all its war paint and we all got another buckshee dinner but not quite as good as last week. The sports were on a large scale and there were about 10,000 NZ boys present, practically every unit in the Division being represented so it could be well called a Diggers reunion. I met a lot of old friends, Stirl being the first and we were together for about an hour and then got separated in the crowd and I saw no more of him until we were leaving which will give some idea of the crowd and all being dressed alike did not improve my chances of finding him. Other boys were Ned May, Lou, Morgan, Bill Cowdell, Two Forsythes, Lance Massey and a few others. There were some very interesting events and was easily the best day of the lot we have had. I was a bit sorry when the fall in call went and we were on the road again for home. 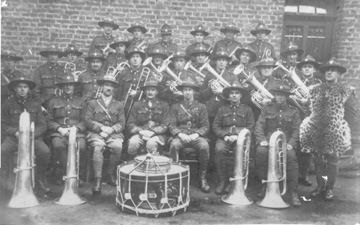 Thursday 27th May, 1918, the Band contest was held. This time for some reason unknown to the common diggers, the Battalion did not go which caused no small amount of disappointment amongst the crowd. We were well polished up for the day and most of us had new gear to wear. We were up bright and early and on our way had the final run over the course. On arrival at the grounds we had a final polish up. On drawing for places we came out seventh so were able to watch the first few bands do their turn. At last we were called and on lining up found one of our men missing and of course everyone’s lip dropped. However, we went on the ground and got inspected and were just ready to step off when the missing link arrived and caused a bit of a fuss, but we got through the rest of the course in good style until it came to dismiss when one man must have turned to his left and got a bit of a cheer. As each band came off the course they were taken into a large marque for lunch. Here we were all seated at large tables decorated with a white cloth, flowers and we had cups and saucers, plates etc., and quite flash I thought. I was one of the Heads. After the last band came off we were all amassed and played a march under Capt. Williams, the musical judge, and then he made a few remarks on the music and gave us a fair hearing. The remainder were not mentioned until the remarks cards came out when we were declared 5th very much to everyone’s satisfaction and for a while they all had a large smile on. I met Stirl just after dinner and we spent the rest of the day together talking over different people at home etc. During the afternoon the divisional boxing championships were fought and there were some real good bouts and one knockout. Amongst the competition was Sgt. Nicklass, the latest N.Z.V.C. He got the worst of his argument. There were quite a few Fritz planes over during the afternoon and they evidently must have seen us as he was kind enough to send over a few shells just as the crowd was leaving the ground but he got his range a bit wrong and sent them all over our heads. Sunday 30th June, 1918. We had a visit from Bill and Joe. They attended our church parade and after the service inspected the ranks and then had a few words of good cheer for the boys and reminded them of the last shilling. The reception was very mixed and at times a few groans and interjections were going forth, which I don’t think the two little love birds felt any too easy. The next day we left that Camp and went back to Marieux and pitched up in a wood, a real good spot. During the early hours of the morning Fritz dropped a few cream puffs around our Camp and got a few horses and a couple of Tommies. The next day we had a solid day digging in and in the evening went into the village and had some eggs and chips and went to a picture show, also a bit of a revue a couple of nights later in C Company with Harry Ashton who had just come back from a few days in hospital. During our stay at this spot I spent an afternoon in Doullens, a fair sized town about 10 km from our Camp. Got a few little articles and went home well loaded up with parcels etc. I heard a Yankee Band while I was there, which was nothing flash. July 10th, 1918. We went to Couin and were put into a billet and a very crook one at that. The first night I slept under a wagon in a broken down shed but as the fowls used it for a shelter before I did, it was a bit too lively for me. So I built a little shack for myself under an apple tree in the yard and was very comfortable. Seeing there were so many fowls about to annoy us I thought I would make use of them. So I built a few nests about the place with some chalk nest eggs. In the result was I had eggs for the next couple of mornings until the Madame found out my little game and it was aipoo nests. While up there I got my NZ mail again, which seems to be getting gradually smaller, a bit hard to bear but suppose it can’t be helped. On the17th July, we left this town and went back to Marieux to our old Camp. During our spell here we had a fairly good time and plenty of good food, thanks to some of the French gardens close by. I went down to Pas a couple of times and spent an afternoon with Sterl at his home down there. Not like the one at Karamea. August 2nd, 1918. We went up to the Battalion at Rossignol Farm. Met Harry Ashton again, also Jack Taylor and Don Smedley. Was not feeling too good while up there so led the simple life. Nothing very startling happened.